Tigran started working at the Council of Europe in 2013, where he manages a project aimed at strengthening the capacity of lawyers and human rights defenders to apply the European Convention of Human Rights (ECHR) and the European Social Charter. It’s a regional project running in six countries (Armenia, Azerbaijan, Georgia, Moldova, Russia and Ukraine). What’s interesting is that Tigran came into law through his language skills acquired during his FLEX year. ‘I think it is quite a common story for the older alumni. When we came back from America, there were very few people in our countries that spoke the same level of English. So many of us started as translators and later changed our careers to something else. I first worked as a translator, then as a lawyer and eventually moved to an international organisation’. 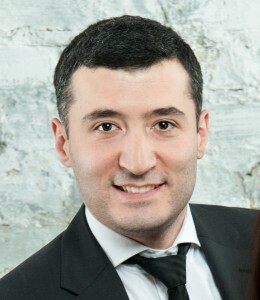 Tigran also served as president of the FLEX alumni association in Armenia called ‘Youth For Achievements’. It was the first registered organisation created by FLEX alumni. During the years of his presidency, the organisation conducted a number of development and educational projects within Armenia and even cooperated with the Ministry of Education in the field of civic education. Tigran’s responsibilities at the Council of Europe include organising special trainings for human rights’ defenders, after which he assists them in conducting trainings and workshops in their countries and monitors its outcomes. Project outcomes are measured on a short and long-term basis. ‘First of all, we assess the outcomes of the trainings and the knowledge of its participants. As for long-term measurement, we are looking at the potential increase of cases brought to the European Court of Human Rights from each specific country and at how well they are substantiated by lawyers. We also monitor positive changes in the field of discrimination within each country,’ – shares Tigran. Challenges differ based on each speficic country. In some it is the political climate, in others it is the logisics side or commonly-held prejudices: ‘It will take a while for these deeply-ingrained misunderstandings and cliches to disappear. For example, some lawyers might speak sarcastically about the rights of LGBT members of the community and you immediately ask yourself a question: ‘Will they represent them in court without such sarcasm?’. However, Tigran points out that some other of his biggest successes are not related to his professional achievements. Building a family, becoming a father and having great friends are central to his life: ‘I don’t have a career for the sake of the career. I do it for my family and the society in which it lives’. Understandably, his message to FLEX alumni is connected to his own outlook, although, as he points out, there is no advice or message which works for everyone: ‘You are all special! Make it count. Make a difference in the communities you live in and use your success for the benefit of people around you and the community’.